60 ml polymeric bottle with a dosage unit. Outer package - carton; 4 l can. High efficiency in various skin diseases. Unique combination of cosmetic and medical functions. Significant shortening of recovery period. Natural highly effective components promote skin regeneration. The drug contains 0.1% chlorhexidine digluconate, 0.1% aqueous alcoholic plantain leaf extract, 0.1% aqueous alcoholic celandine extract, 0.4% provitamin B5 (as active ingredients), as well as excipients (surface active substances, glycerol, allantoin and others). Chlorhexidine digluconate provides antibacterial effect on gram-positive and gram-negative bacteria, dermatophytes and lipophilic viruses. Extracts of plantain and celandine have bacteriostatic, antipruritic, anti-inflammatory and wound-healing properties, promote fast wound cleaning and accelerate granulation and epithelization. Provitamin B5 strengthens cellular respiration and has regenerative effect on pelage and skin. Glycerol and allantoin activate metabolic processes in hair bulbs and skin, promote healing of affected tissues, remove skin dryness and exfoliation, ease combing and prevent hair entangling. 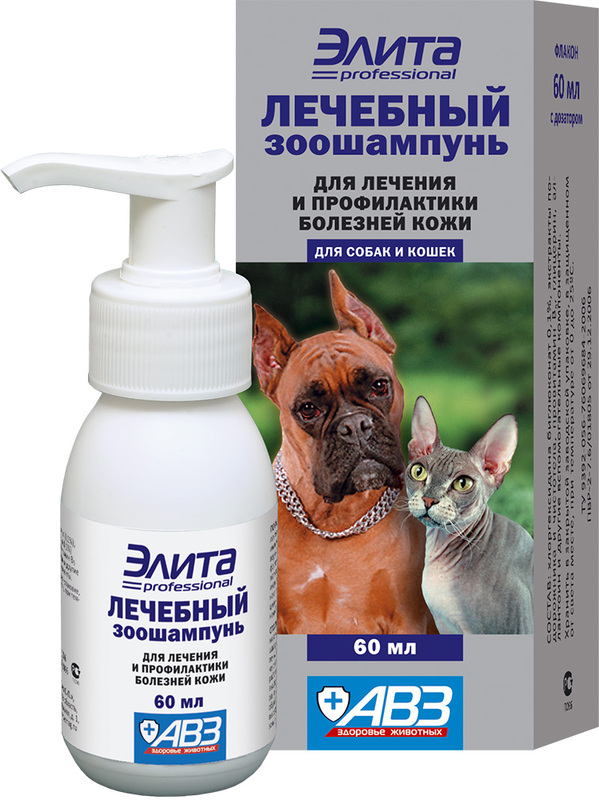 Use in dogs and cats to treat small wounds, scratches, cuts and other skin diseases complicated by bacterial infection and to prevent complications after haircut and trimming. Weeping eczemas, allergic dermatitis, hypersensitivity to the drug components. Moisturize animal hair with warm water, then apply shampoo (0.5-1 ml per 1 kg of body weight). Gently rub it until foam appears and wash away. Repeat the procedure and leave shampoo on pelage and skin. In 5-7 minutes accurately wash it away and carefully dry processed surface. Perform a processing once a day within 3-5 days. Prevention: administer in a single dose. Avoid eye contact with the shampoo during processing of affected areas in the region of head. Adverse events and complications generally are not observed in case of administration as per package insert. Store shampoo in closed original package at 0-25°С. Protect from light. Keep out of the reach of children and animals. Shelf life is 18 months from manufacturing date.